Q: Can you use the earthbag technique to build a house of any shape other than domes? A: Earthbags can be used to build a house of almost any shape, but care must be taken in the engineering design to allow for sufficient reinforcement and buttressing of the walls where needed, such as with buildings that are more rectilinear, with more or less conventional roofs. There are, of course, advantages to domes that are worth considering: they are generally stronger under stresses such as wind or earthquake, they use less material in creating the same amount of living space, and they do not require other tensile materials, such as wood, to enclose a roof area. 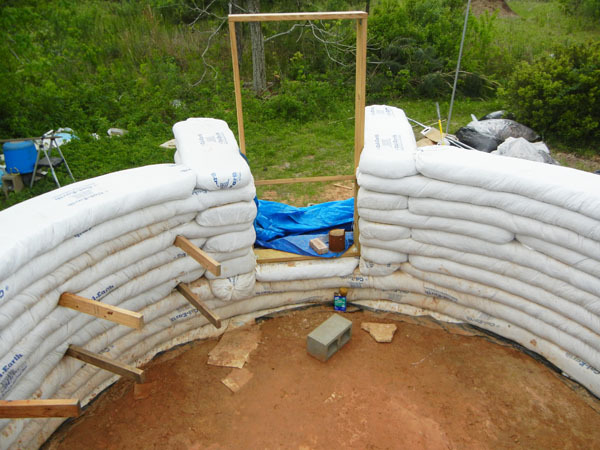 Even vertical walls if they are curved are inherently stronger, especially with earthbag construction. Q: I am going to build a lighthouse cottage on the ocean! The main structure will be round but preferably a little higher than a normal earth bag dome and I am looking at using a different type of roof rather than the dome. I am not really sure... I am also planning to attach a smaller "pod" or two to it. I want to see if you have any recommendations with respect to the best type of roof to use for my design. A: A circular cylinder of this sort should be quite strong and an excellent shape for using earthbags. This is a fun design. There are many possible roof concepts that would work with this. One would be a dome, which could be either somewhat conical and be made entirely with earthbags, or it could be hemispherical if a rigid framework is provided for it. Another possibility would be a simple shed type roof that truncates the cylinder at an angle. One consideration is whether you want to have a look-out on the roof, in which case the shed roof could be raised enough to provide this. This type of roof would need to be made of other materials than earthbags, obviously. I was confused at first in trying to figure out how much I would have to bring the bags in with each layer by the cm or inch and was looking high and low for formulas on truncated cylinders and cones. In fact, it turns out that I am building a frustum rather than a cone or cylinder! I am concerned about making sure that I get the exact angle on the walls without losing any stability. Do you think that it will be OK to go from 20 feet to a 10 or 12 foot second level (supported only by cross beams to support the loft). Also, is there an easy method to bring the bags in on the right angle? I have a vague memory of being introduced to the concept of frustums in solid geometry in school, but I have not heard the term for quite awhile. As far the angle of leaning or decrease of the walls of such an earthbag frustum, I would suggest that you can safely incline the wall by as much as 60 degrees (with respect to the horizontal) without compromising safety. The lighthouse design you showed earlier doesn't even come close to this...so I wouldn't worry about it. The most accurate way to measure exactly where to place the bags as you go up would be to create a central column of pipe that is well braced into place, and use this with an adjustable compass that is attached to it. Then, for each course you figure out from a scaled drawing exactly what the radius should be at that point and adjust the swing arm accordingly. What formula would one use to calculate the way to set the compass? 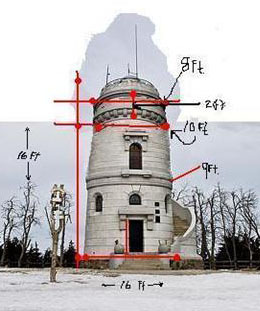 The simplest way to do this is to make an accurate scale drawing of the shape you want to achieve, looking from the side, and then divide this into vertical intervals, of perhaps every 6 inches, and draw horizontal lines across at these intervals. Where they intersect the shape line can be measured, either to the central axis line, or as a diameter across the entire distance and then halved for the radius. Q: I'm looking for ideas to improve the basic process of making walls of very lightweight material. One potential glitch is getting the bags to align in straight, vertical walls. Lightweight bags will shift around more than bags of tamped earth. Maybe you can think of something better, but I thought of building a light gauge metal frame of rebar that's covered with plastic mesh. Rebar is cheap and easy to weld. It would take extra time and money to build, but it should speed up the bag stacking process and get walls better aligned. A: This is an interesting idea that would be fun to try out some day. I think it depends on the design and shape of what is being constructed how well it would work. When I was doing some design work for a couple who wanted a more hemispherical earthbag dome, I came up with a concept that fits in with your ideas here. I never got to making any drawings for it, but basically it was to make a welded truss with rebar curved to the exact shape that you want. Only instead of making triangulated braces between the two parallel arcs, the cross pieces would be welded so that they would be horizontal when in place. This would allow the earthbags to be laid directly in between the two arcs, and also between the cross braces. I think that this system could be quite strong, and would eliminate the need to have any other forming or placement system while building. Each arched truss would be attached to a central hub, and perhaps also embedded or attached to a foundation bond beam of concrete. I also think that a system like this might allow the construction of larger diameter earthbag domes. Q: Is a round dome (or corbeled dome) the ideal shape to withstand high hurricane winds? A: I believe that circular domes have been proven to be the most stable building shape (other than underground structures) under severe wind conditions. Q: How would a dome shape vs a non-domular roof effect the basic price? A: A dome most certainly can be built for less than a standard roof structure, since all of that material to frame and sheath a roof is eliminated. Q: Would building a round structure be a bit easier to erect than connecting several connecting domes? A: It is always complicated to connect domes together because you have to figure out how make the connection between them, whether it is a vaulted passage, or they intersect in some way, allowing the passage. Vertical-walled structures are easier to build in this regard. Q: I am researching building a house in the mountains in Portugal. My question is, will it be possible to build a sandbag house in large scale or does it need a supporting oak frame for example, to make it possible? I have an architect studying the possibilities but she is new to all this. A: It all depends on the design and size to what extent it might need additional support. Rounded structures can be more self-supporting than more square ones, but even these can be self-supporting if they have proper buttressing, bond beams, etc. 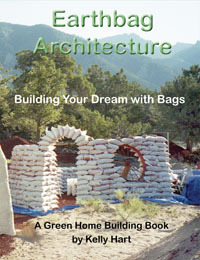 So, you really have to analyze each design to see how adaptable it is to building with earthbags. Q: Do you think that shape shiftingwith the fill material could be resolved by a bamboo framing system? Or maybe rebar placed though the earthbags ( if its possible to puncture rubble filled bags)? A: Yes, it is possible to stabilize an earthbag structure that would otherwise collapse by resting at least some of the bags on a rigid framework, provided it is strong enough to support the weight. I did this with a hemispherical dome once using a wood-framed geodesic structure for support. And I also supported a large elliptical dome with a rigid pole framework. Rebar driven through the bags at critical location might also provide enough rigidity. These are easily driven through most kinds of fill material with a heavy hammer. Q: I want to know what is the largest dome or vault you can build with earth bags? I have seen people use a prefabricated metal top to make a vault or airplane hanger type structure, but I want to know if I could make that same arched roof with earth bags, and if I could, what would be the max span that I could do safely without too much beam support? A: We usually tell people that about 20 feet in diameter is as large a dome made with earthbags as is practical. 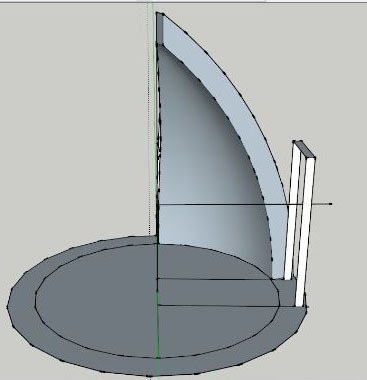 The shape of such a dome would best have a higher profile than a true hemispherical dome, however, so that there is no tendency to cave at the top. As for vaults, the possible size is much smaller; about 8 feet wide is the largest I have seen, and these have very thick walls or buttresses on the sides. Most larger vaults either use a permanent form (like the metal quonset you mention) or shift to ferrocement or some other material for the vaulted area. Q: Is it possible to build a hexagon shaped dome? A: This might not work, at least I have never seen such a faceted dome. The problem is that with the dynamic forces acting on domes, the circular shape is what naturally happens under all of the stress. The barbed wire in all of the courses needs to be pulled tight, and that happens in circles but not hexagons. If you want a hexagonal shape, make the walls vertical and put a different roof on it. Q: I am hoping to build a hyperadobe house soon and am wondering about limitations on wall height and over all circle diameter and if these can be pushed with reinforcements and if so, how? A: There has not been a whole lot of building done with the hyperadobe concept since it is so new, but generally what can be done with standard PP earthbag tubing and be done with the mesh tubing. If your walls are vertical, I can see no limitation as to diameter of a circle, but if you are thinking of domes, then the limitation might be around 20 feet. As for wall height, the rule of thumb for any earthen wall is that the height cannot exceed ten times the width of the wall at the base. Q: My husband and I plan to build an earthbag house into the side of a hill. From reading your pages I see that round rooms would be most structurally sound. Would a hexagon or octagon shape provide the same kind of stability? We really would like to have flat wall surfaces. A: Yes, a faceted building can also provide good support when bermed, especially if the segments aren't too long and the building is well engineered for this. 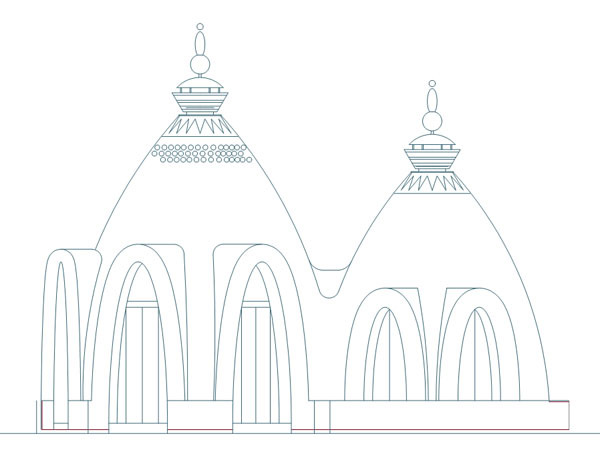 Q: Myself and my architect friend came up with the attached dome design. The height is not the same as the diameter, and I would like to know your opinion on this design - is it structurally sound, and is the width of the bags appropriate based on the size of the dome? A: Your design appears to be a sound one to me. There is certainly no problem with the height being greater than the base width. In fact, with so many openings it is probably a good idea for the lower section to be more vertical, as it is, to diminish the outward forces on the lower portion. I would recommend a bond beam at loft level, just above the doors, to assure integrity of the structure. The wall thickness and specified bag size also seems appropriate. It is a lovely design. Q: Hi, I'm in the process of building an earthbag dome and your website has been a valuable asset. I'm just above the 5' mark of my 14' diameter X 14' tall structure. Distressingly, I realized as I completed the 12th layer that my door frame is too far out (7' 7" from center). The door is set on the fourth layer, the top of the frame sits at 8.5' tall. This creates a situation in which I will not be able to span directly over the door frame with the earthbags as I will have stepped in about 2.5 feet away from the door frame. I would like to know what my options are in this situation. I've attached some pictures to help you visualize. The 3D picture shows where the door frame is in relation to how far I will need to be stepped in. If possible I would like to continue as is and span the gap away from the door frame with an arch. If that seems structurally unsound I could create buttresses coming inside for a new frame where the top of the frame is set so I can go directly over it with the bags (I really wish I had done this in the first place). A: You have encountered a common problem that first time dome builders confront. Fortunately, it appears that you have also provided at least part of the solution, with having created the long entryway walls. You should be able to continue up with these walls and when you get to the top of the door frame it is possible to make a small arched vault, running the tubes of the vault in the same orientation as the wall. I did something similar with the first small dome that I built, although in my case I did create an interior vertical supporting buttress. I think you should probably be able to make it work without the interior support. I would advise using stabilized fill in the vaulted portion. Q: What if I just continue vertically from above the arch about 4.5 ft and build a single pitch roof over that? Does this present any structural issues? I'm using the largest cal-earth bags, 24in. Each layer has 2 loops barbed wire. Advantages: More space in loft area, less complicated roof solution, solves issue of spanning doorway, I really like the look of it; it's unique. Disadvantages: Structural integrity? Safety? Too much straight vertical compression on already stepped in bags? I have stepped in 1.5ft so far and the earth berm is already there. Am I past the point of no return for completing the dome structure or is this a viable option? Has this been done before? A: I think that you could probably do this safely. I would suggest that at the point where you start to make the vertical walls, you pour a solid reinforced concrete bond beam that is well attached with rebar to the wall below.This will help secure the shape and provide a good solid anchor for the second story floor. I have never seen anything quite like this before, but theoretically it seems to me that it would work. I once made a miniature kit of earthbags filled with sand that I used to test out ideas, and if you did something similar you might be able to test the concept. Q: My wife and I are planning on building a home using the superadobe techniques. Your recommendations are to keep the diameters no more than 20' for a dome roof. Because of this, we are designing our home to have multiple structures. We are in our 50's and do not want to rely on climbing steps/stairs for added space using lofts. I believe there are 2 options for connecting structures: overlapping or short length archway. Which do you recommend? If an arch, how long and wide can it be? How wide can doorways/arches be? A: Either approach has been successfully used, but the most common one is to overlap the domes to some degree. 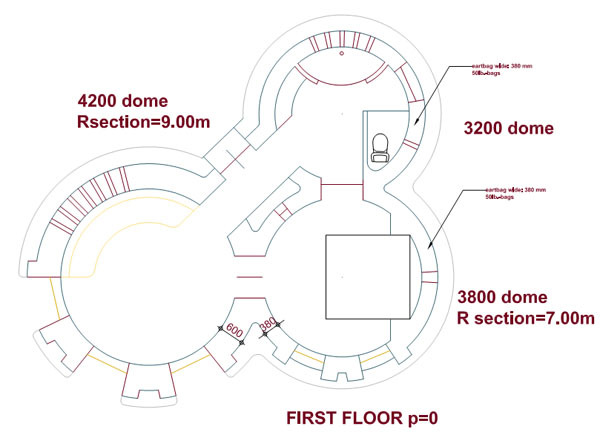 Making vaulted connections between the domes might be a bit more work, as you have to integrate the vault with the adjacent domes and this can be rather tricky. One plan that shows this approach can be seen here. Arches spanning up to 3 feet are rather straightforward to build. Q: I am attaching a page from an earthbag book where they have done the calculations to scale of how much to step in each row. 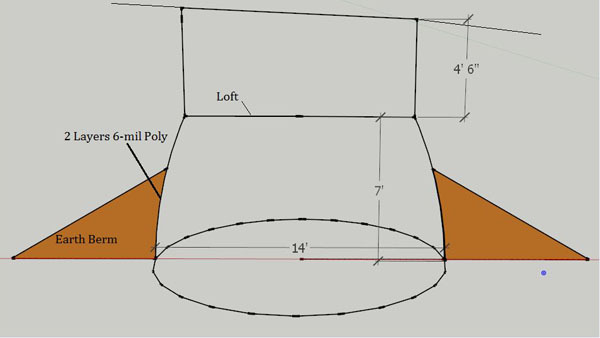 I am wondering if someone can do these calculations for me for a 20ft and a 16ft dome? This way when I begin to lay the rows I easily know how much to step in each row. A: I think that you can do this yourself. First take a piece of graph paper with all of the little squares marked. Draw a vertical line in the middle of the page and a horizontal line down near the bottom that will represent the ground level of the dome. Then count how many squares you have on either side of the line. See how many squares is going to be one foot for either the 16' diameter dome or the 20' one. Make it as large as possible on the graph paper. For instance, if there are 16 squares on either side of the center line, then each square can represent 6" as your scale for the 16' diameter dome. Then, take a compass and place the point at the bottom of one side and open the compass to stretch all the way across to the bottom of the other side. Then draw an arc on the paper using the point on one side at the bottom and going up until it intersects the vertical center line. Do this on both side, so you have the rough shape of your dome. So then you can use that grid pattern of squares to figure out what the offset amount would be for each increment, or course of bags. For instance, if you have a 6" grid (which is close to the thickness of an earthbag) then the corbel amount can be figured out. You could write the distance out from the center line on each course, like they did in the drawing from the book. From this you can figure out the difference from one row to the other. You will need to estimate what percentage of the the 6" square is where the cone line goes and convert this to inches. For instance, if about 1/6th of the square is crossed, then that would be one inch. Q: Please check the photos that I have attached, and either tell me where the building is or let me know of some similar style. Hopefully I can visit one which done by such method. My next project relates to a style with a dome and flat roof. A: I am not familiar with the building that is pictured. 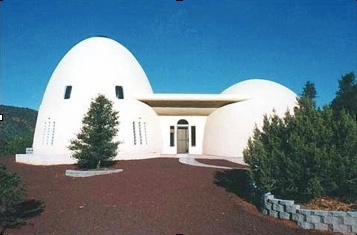 I suspect that it was made with ferrocement, or some similar technique, since earthbags are not usually employed for true hemispherical domes, like the one on the right. I did once design such an earthbag dome, using a geodesic inner support frame, and this worked. Q: Is this correct that round house from earth bags with diameter 50' is doable at all in theory? Are there any limits or restrictions for diameter? A: With vertical walled roundhouses there is virtually no limit to the diameter, as far as the bags go. Large diameter roundhouses need to have some sort of engineered roof system, I suppose, since there are limits to how long ordinary rafters can be. Q: I am wanting to build a hyperadobe home in northern Arizona, and am wondering if it is possible to build a hexagonal or octagonal yurt style home. Also, would a two story hexagon work, or would that be too much weight? A: Yes, you could build a hexagonal or octagonal yurt style home using hyperadobe, and go two stories if you engineered it properly. If the length of any of the straight sections of wall were not any greater than about 10' you wouldn't even need to buttress the walls. Q: Using the 18 inch poly bags, when compacted equals out to about 5 1/2 by 15 inches. I was wanting to do an oval bath, being 12 feet by 6 wide. do you think that the bags could do this tight a curve? A: You can make pretty tight curves with the bags. Consider how domes with cantilevered courses of ever smaller circular shapes are done up to quite near the top.